Visual Studio provides many windows that are used for designing, developing and debugging software. For developers that work with varying screen resolutions or numbers of screens, it can be useful to store and reload window layout configurations. Whilst developing software you may use many Visual Studio windows and organise the layout of these windows to your personal preference. This can improve your productivity, as you are able to quickly access the information that you wish to work with. However, if you work in multiple locations with different hardware, this can become problematic. For example, if you sometimes work with multiple monitors you may place debugging and informational windows on a second screen. If you load the same configuration without the additional screen, Visual Studio will automatically change the window locations so they remain visible. This can ruin your preferred layout. When you later return to the multiple monitor configuration, the original window positions will not be restored. If you are using Visual Studio 2005 or later, you can work around this problem by creating and saving several window layouts. You can then load a different configuration according to the available hardware. You can also use this technique to use different layouts for different types of project. You might decide that WPF projects include some windows that are not required for ASP.NET solutions, and vice versa. You can save the current window layout using the Import and Export Settings Wizard. To start, open the "Tools" menu and select "Import and Export Settings...". Click the Next button to move to the second page of the wizard. In the second screen you can select the settings that you wish to export. Click the checkbox alongside the "All Settings" option at the top of the list to clear all of the selections, as we don't want to export the entire configuration. Next, expand the "General Settings" node in the tree and tick the "Window Layouts" option. With the single option checked, click the Next button to move to the final page of the wizard. Here you can specify a name and path for the new settings file before clicking the Finish button to complete the process. You can repeat the above process to create settings files for all of your preferred window layouts. 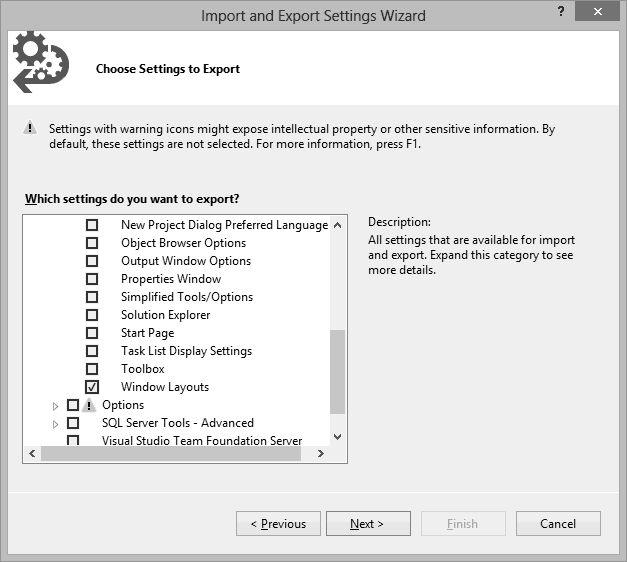 To restore a specific layout use the same wizard with the "Import selected environment settings" option, as described in the article, "Transfer Visual Studio Settings Between PCs".